Easter is right around the corner and it’s time to celebrate all things spring! There are many Easter traditions – church visits, Easter egg hunts, hopping bunnies, hot cross buns and sending Easter cards. These are all fun and memorable ways to spend time with your family and friends. According to GCA, Easter is now the fifth most popular occasion in UK and Ireland in terms of sending cards. Around 10 million Easter cards were sent in the UK and Ireland, That’s about 2 million more than the previous year! Easter is a wonderful time to reconnect with family and friends. 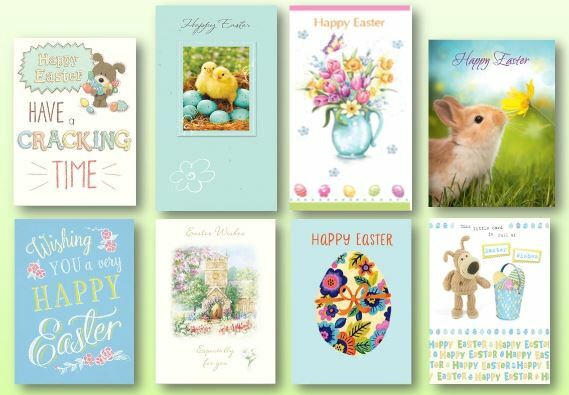 Greetings cards have remained a very popular medium to express wishes and spread the joy at Easter! So how did it all start? The practice of sending Easter cards began in the late 19th century. The first card was created when an Easter message was added to a drawing of a rabbit. This marked the start of a tradition that we still follow today. With Easter just over a week away, we hope you’ll find something beautiful and unique in our Easter card collection to send to your family and friends. This year, our card range spans everything from traditional styles featuring Church scenes and spring blooming flowers, to designs appealing to a younger recipients, like chicks, rabbits and Easter eggs. Our fresh spring colour palette of yellows, oranges, greens and blues really helps to symbolise this yearly celebration of nature awakening and the promise of warmer weather to come!